How the oliveoil of DOGAL is made?
" Taris Zeytin (Taris Olive)", the company who produce the olive oil we sell, located in Izmir Turkey, is founded in 1915 and has been producing all the variety of olive products. It is famous as a brand of high-quality olive oil. Staff in Taris and DIGAL's shop manager, Mete (the BIG one in black). The sign says that "No other oil can pass this gate but Oliveoil". How about the FAT on the waist of our Manager Mete(^^;)? The olive garden does not seem to be artificial. Woman who gathers olive by hand, one by one. 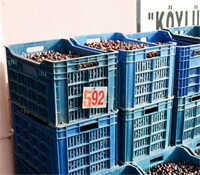 Olive oil of Taris is made in Aegean Sea area. Despite the fact that the company is large, it's olive oil is NOT produced after gathering all the olive fruits to one place. Each of 33 small co-op gathers the fruits from the contract farmers of the area then produces the olive oil without delay. This is how Taris keeps the quality of the olive oil extremly high. The olive gardens in Turkey is quite natural. They are different from Spanish huge gardens with straight lines of olive trees for efficient production with machines to boast world's No.1volume of manufacture and the low price. Turkey produces the world's No.4 amount of olive oil and exports a lot to Italy. Possibly it was Turkish olive oil that gave the flavour to the spagetti that you have eaten while your trip in Italy. The olive which the contract farmers bring to the co-op is put a tag to show who has gathered from where, then pressed separately. The pressed olive oil is ranked, then the farmers is payed based on the rank. So the farmers always make efforts to enhance the quality. But the olive is the gift from the great nature. 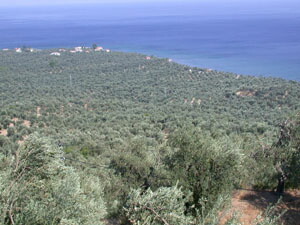 It is not possible that all farmers can produce the highest quality olive. 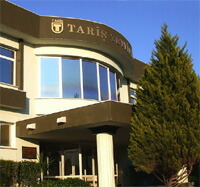 But Taris has about 27,000 contract farmers and choose the good quality olive oil, so Taris can always stabilize the quality. 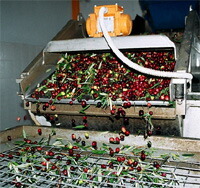 Olives are washed with water and the leaves are taken away. In the fields (except Organic garden) they use 2 kinds of agrichemicals, Deltamethrin and Dimethoate, but all of the chemicals are washed away and does not stay on the olives (these chemicals are also permitted in Japan). 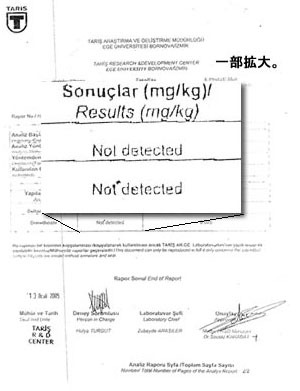 The result of analysis which shows the agrichemicals is not detected. After washing, olives are grinded by millstones. 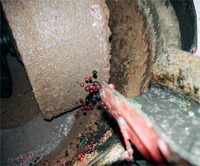 Although the power to grind the mill has been changed to electricity, the stone is all the same with the older method. 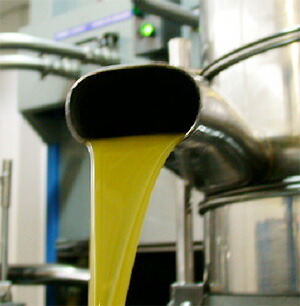 Running olive oil. Smokey oil before filteration. 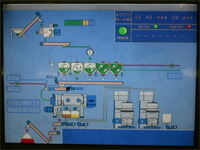 Finished oil are ranked and stored in different tanks. 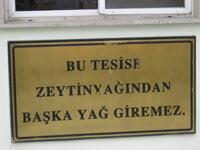 After this olive oil is sent to the head factory in Izmir. 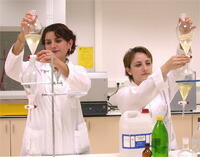 In the factory all the process is controled by computers and they check the quality of the product. It is a successful marriage of the new technology and the long-time experience of the old method. Factory at the head quater. It is forested with big mashinaries and tanks. 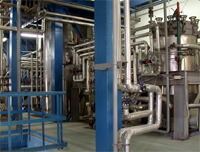 Each rank of olive oil is stored in the larger tanks at the mother factory, then the lower rank oil is refined. People at the QA section. They continually control the quality. Then the olive oil which passed the QA is filled in bins, tins and pets to be finished. In broad terms, this is how Taris olive oil is made. And the ones we choose and provide here in Japan are these ones. Copyright (C) Serce Ltd. 2005, 2016. All rights reserved.